Recognition. Appreciation. Respect. Words that stir the hearts and rouse the souls of all who strive to honor our dedicated police heroes. This collectible commemorative police officer badge embodies that spirit. Emblazoned with our nation's proudest symbols of strength; the stalwart eagle and fluttering old glory in red, white and blue enamel, measuring approximately 1″ x 1.5″ tall, in silver high gloss finish with a clutch attachment. Whether a gift for the beloved law enforcement professional in your life or as your department's award to the top officer of the month, this mini badge is more than just a token… it is a treasured expression of admiration and devotion. To protect and serve… honor, duty, courage. We proudly and gratefully salute you. 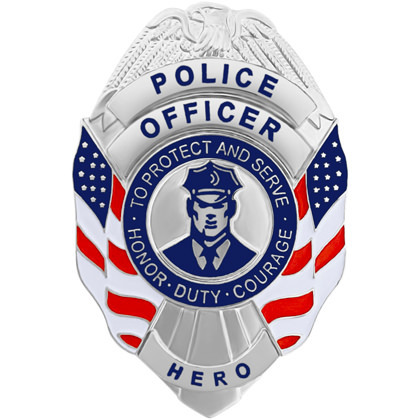 Get the ultimate collectible commemorative mini badge today to show your pride for the U.S. law enforcement!